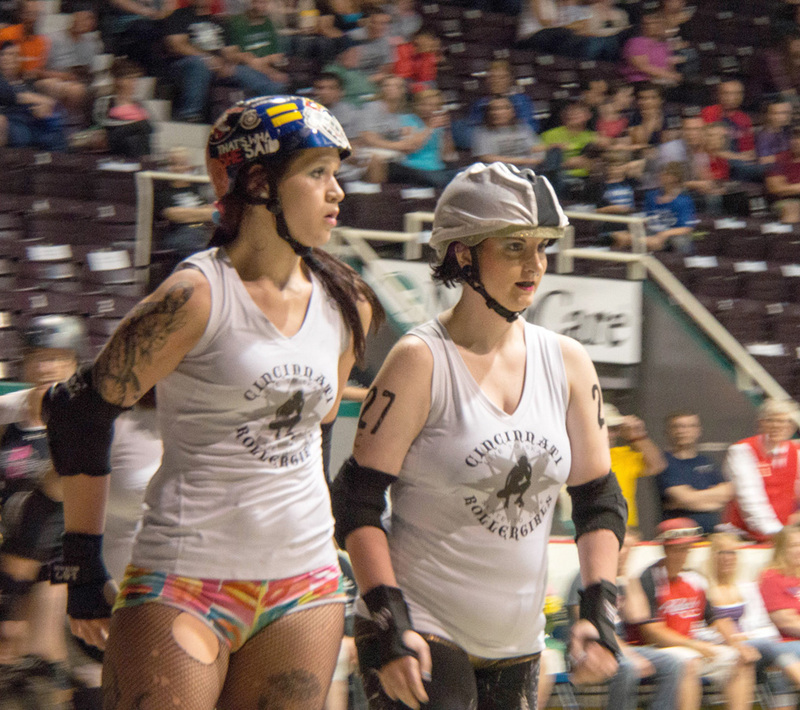 On the evening of May 10th, Scoot and Shoot visited the Roller Derby at Cincinnati Gardens. This was a particularly challenging photographing venue. There was low light and high action. I used a high ISO from 1600 to 3200, and had my lens wide open at an f-stop of 5.4. 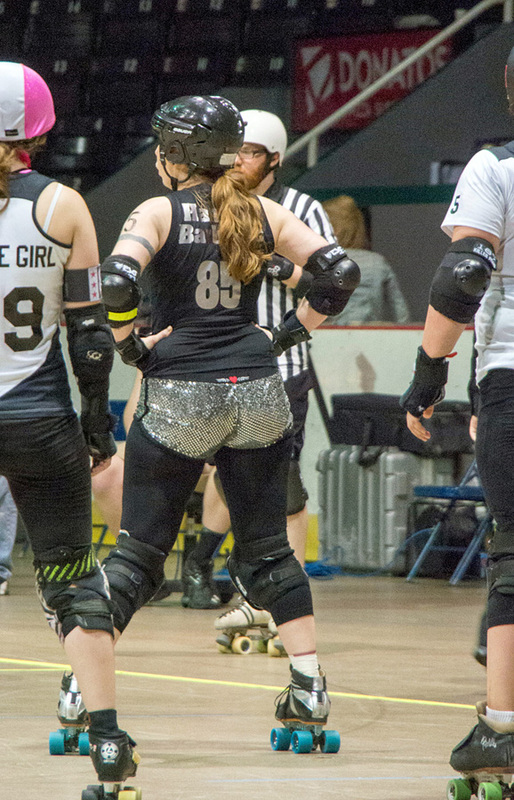 In some cases I tried to pan with the jammer. 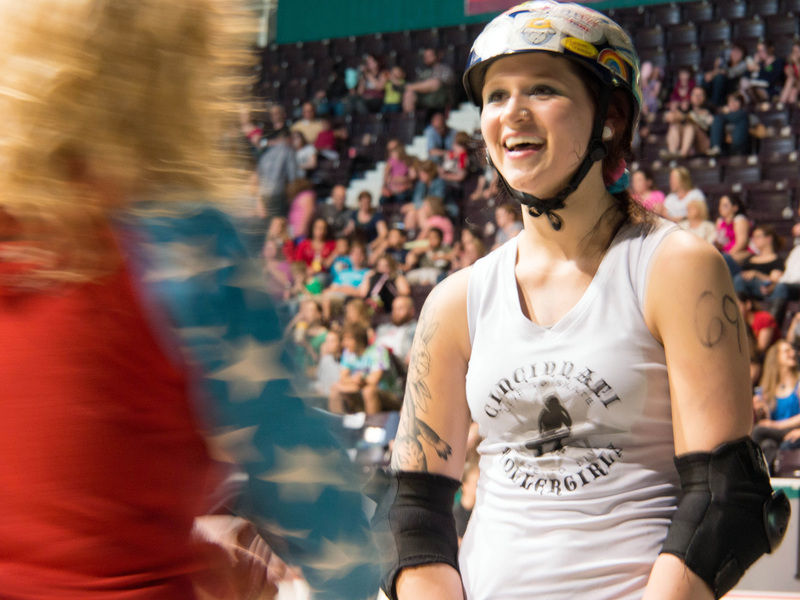 Mostly, I wanted to share with you the excitement of the Cincinnati Roller Girls. 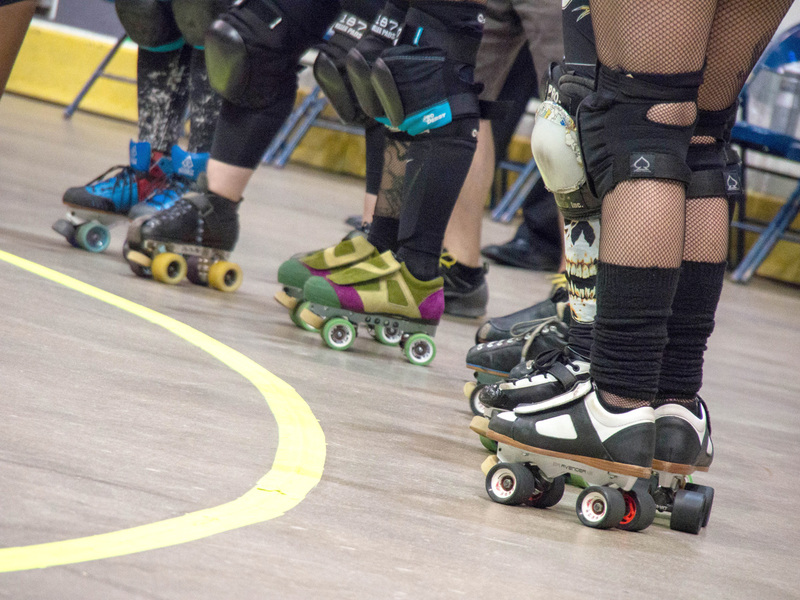 The names alone will make you wonder—Cherry Choke, Cincy Psycho, Candy Kickass, or Hannah Barbaric. Rough and tough names for a rough and tough sport. 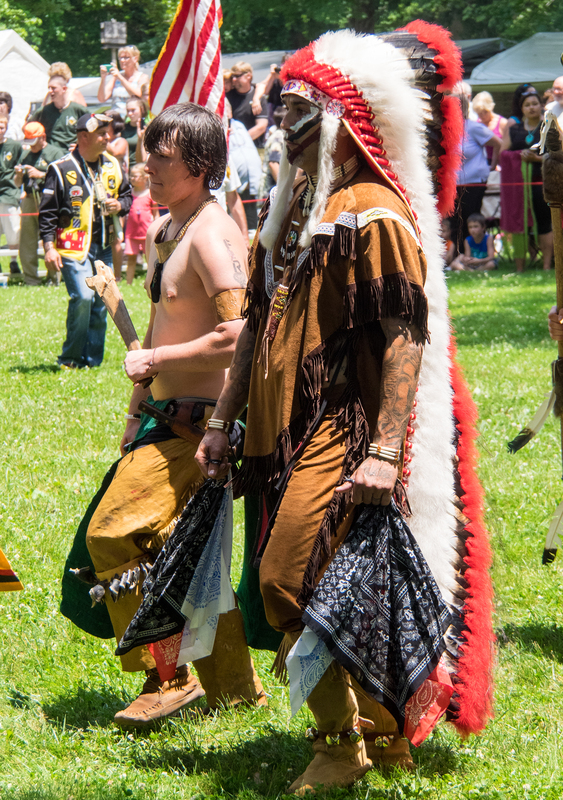 Many are decorated with tattoos. Their clothes sometimes take a beating. 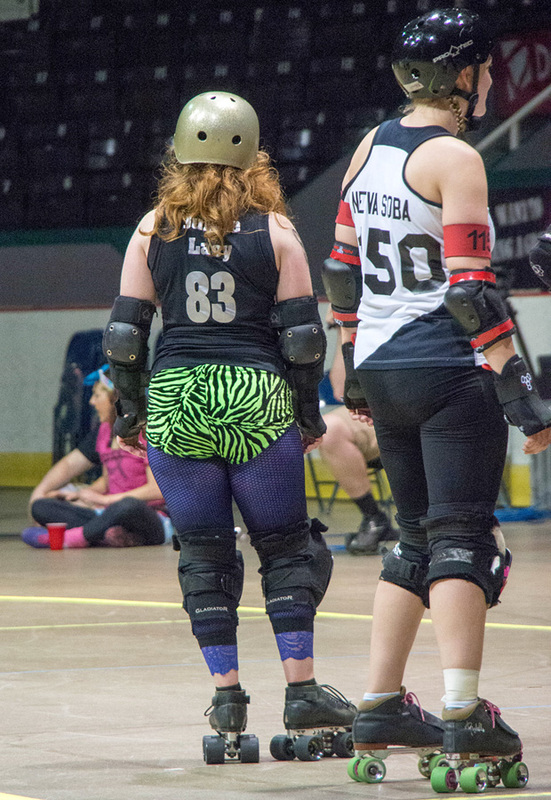 I’d never been to a roller derby before. I always thought of it as a rough race. But now I know more. 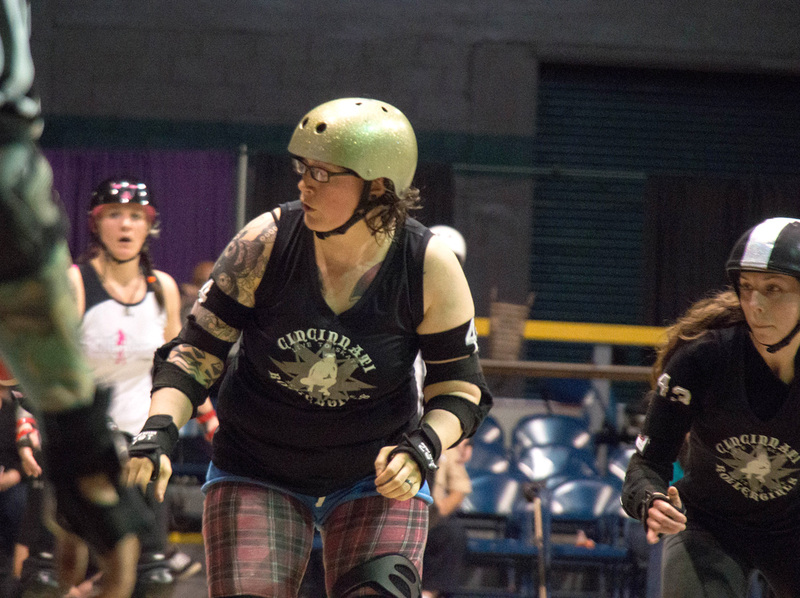 The woman above is a jammer for the Cincinnati JV or Varsity “B” team, the Violent Lambs. 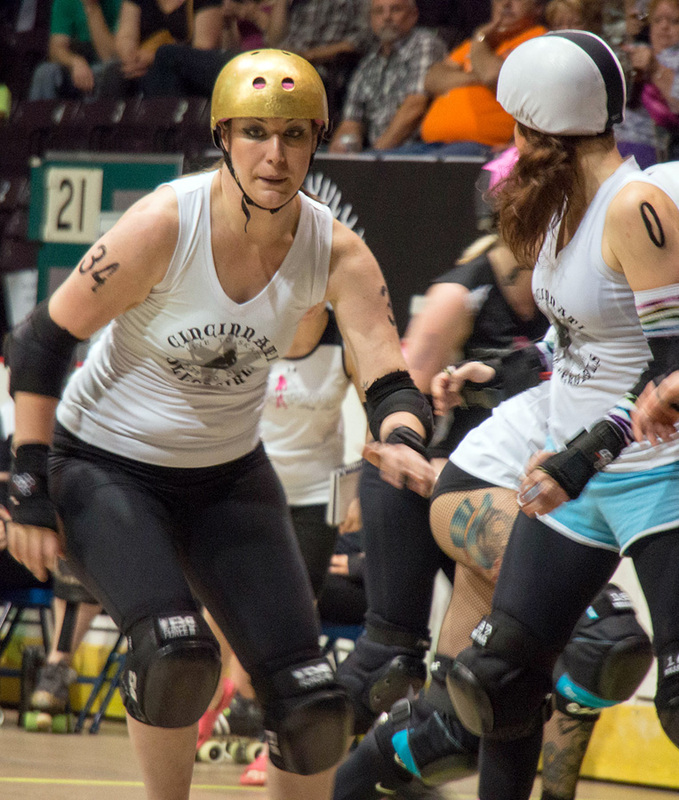 The jammer for each team is the only person who can score points, and she does it by passing opposing team members. 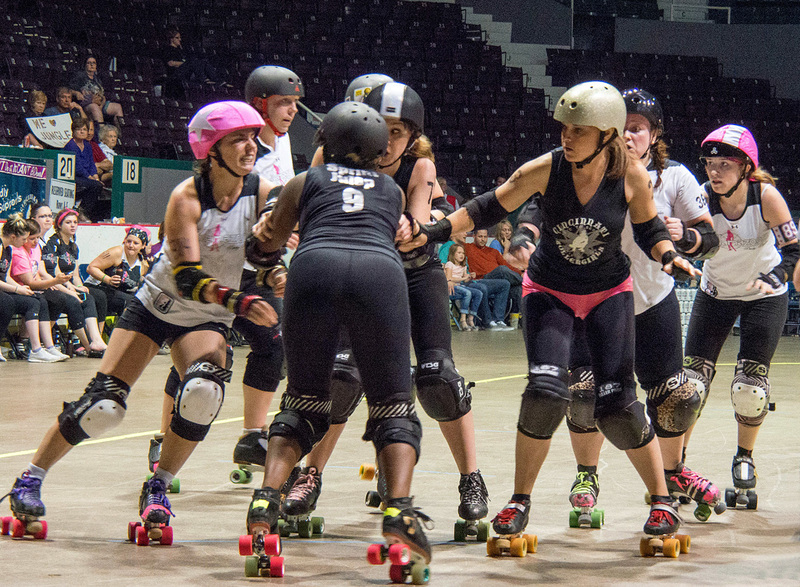 The rest of the skaters make up the pack. 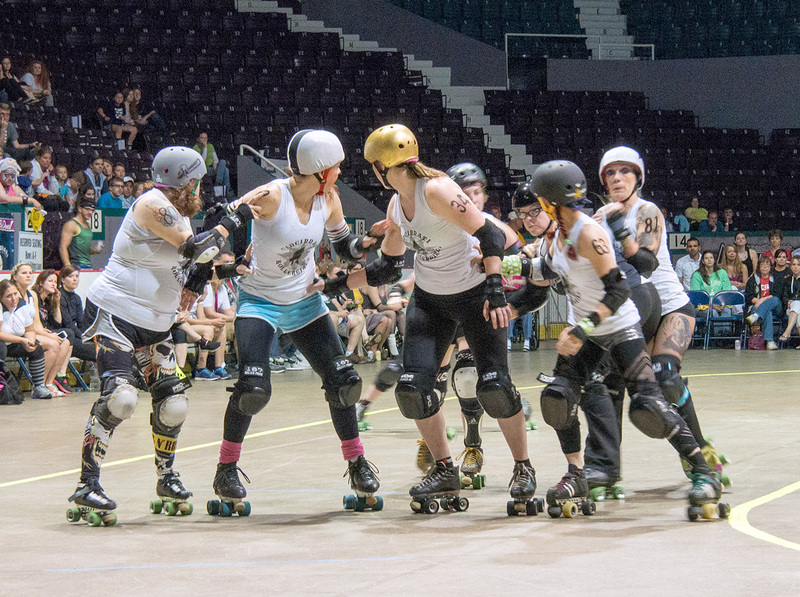 They try to block the opposing jammer. 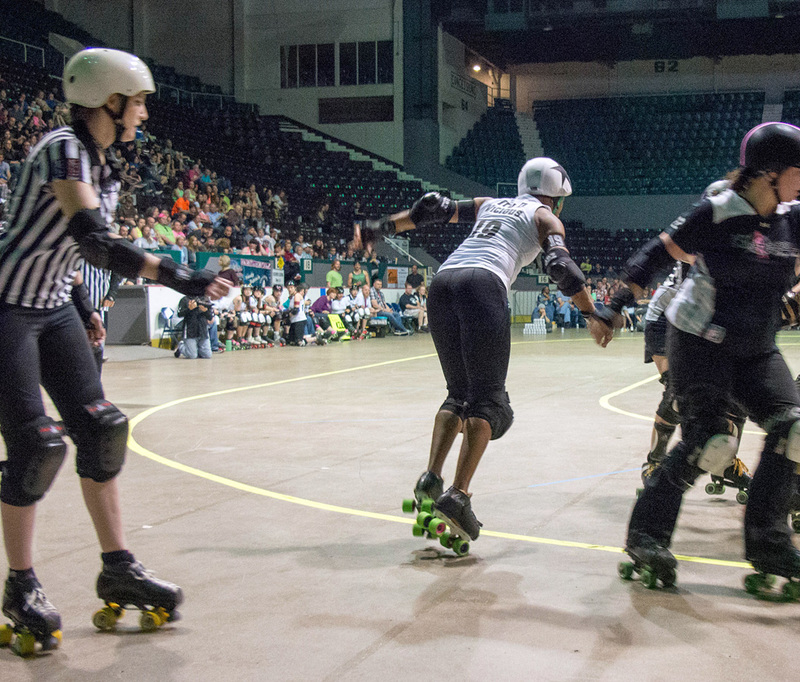 The game is played in 2-minute jams started by a whistle. 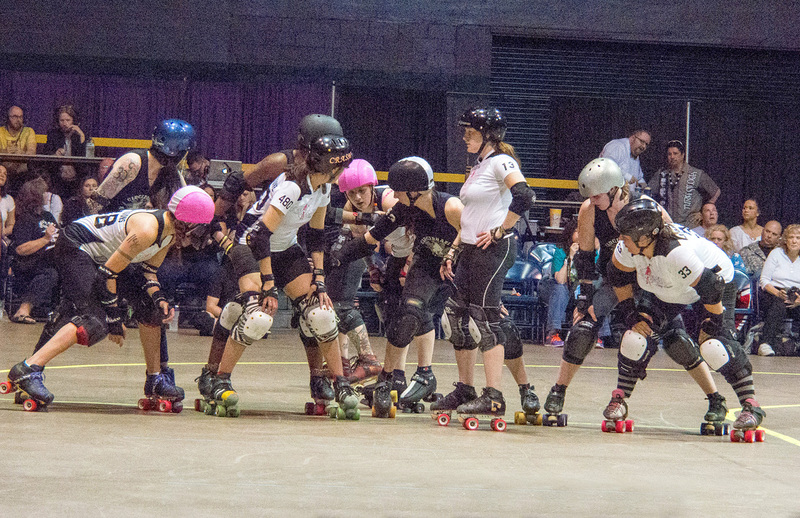 The jammers start each jam behind the pack. 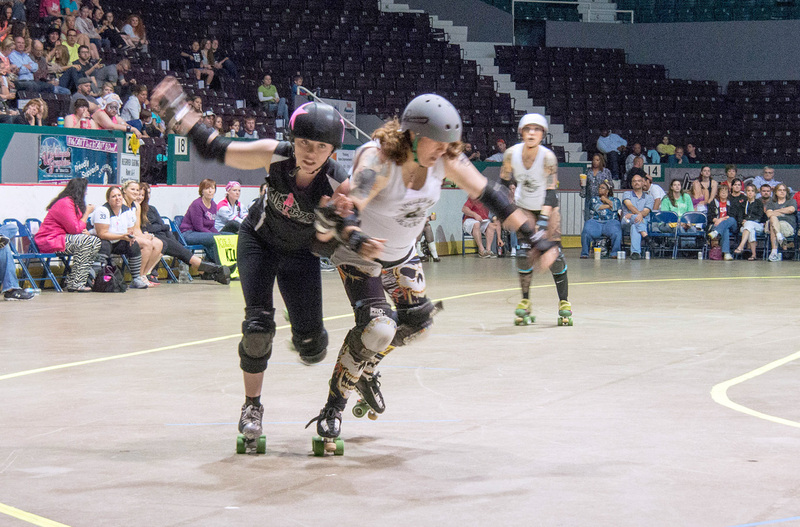 The first jammer to get through the blockers is awarded the lead jammer. 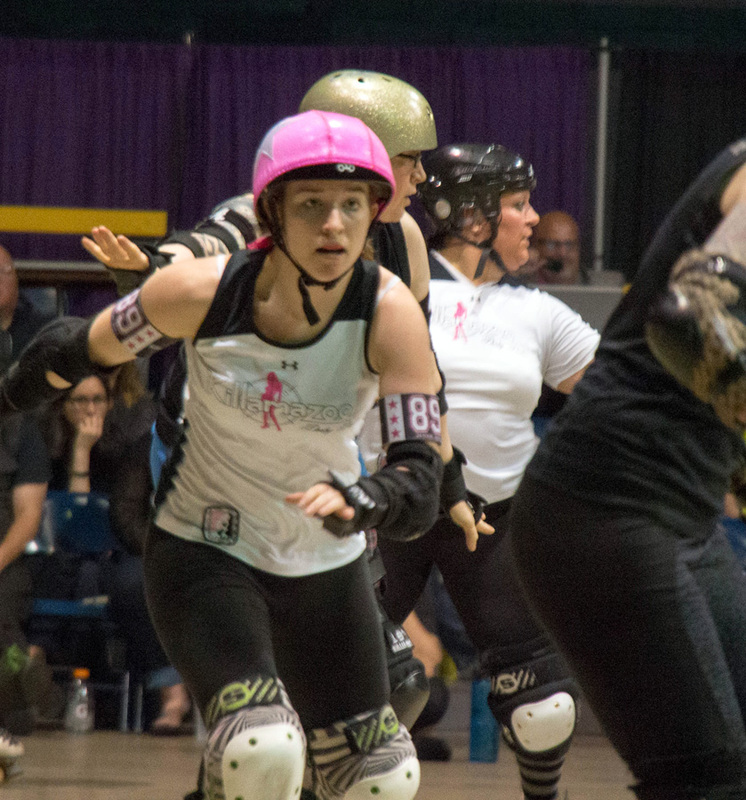 The lead jammer can decide to end the jam before the 2 minutes are up if it is to her team’s advantage to do so. 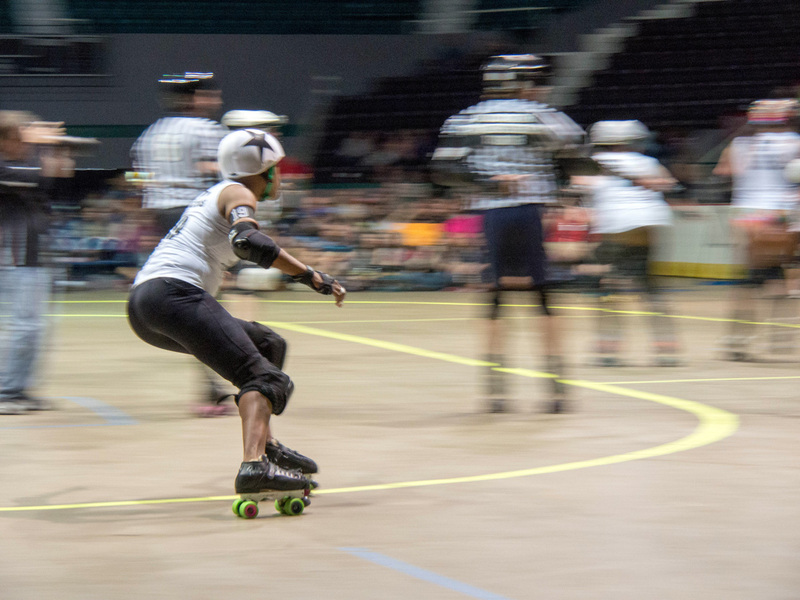 Once the jammers have made it through the pack, they skate quickly around the rink and then they each begin to score a point for every opposing skater they pass in a lap, including the opposing jammer and penalized skaters who are sitting on the bench. 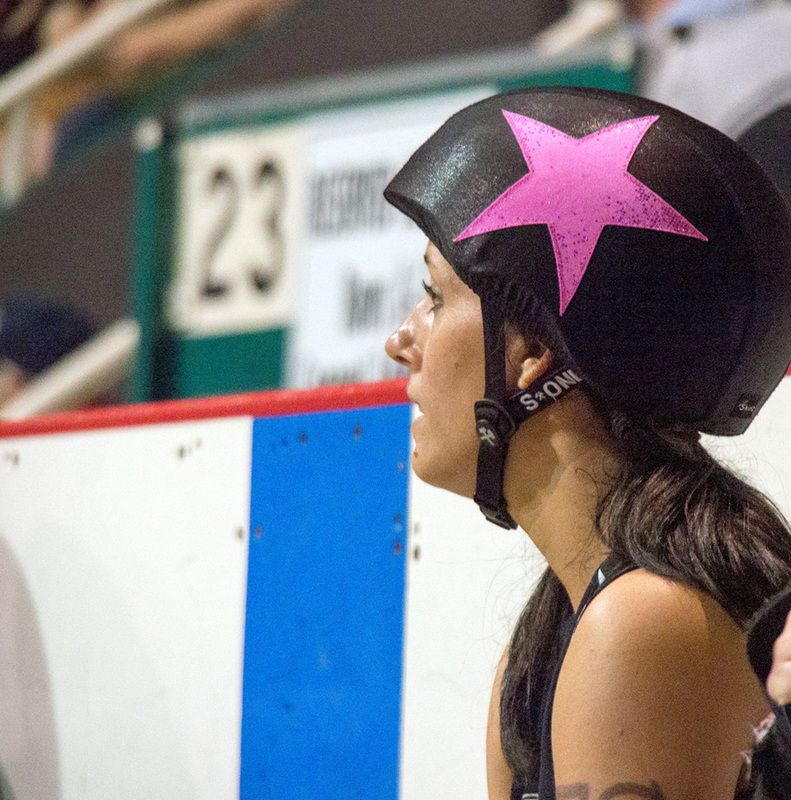 (I’m not sure what actions result in penalties, or time-outs, but they happen quite regularly.) 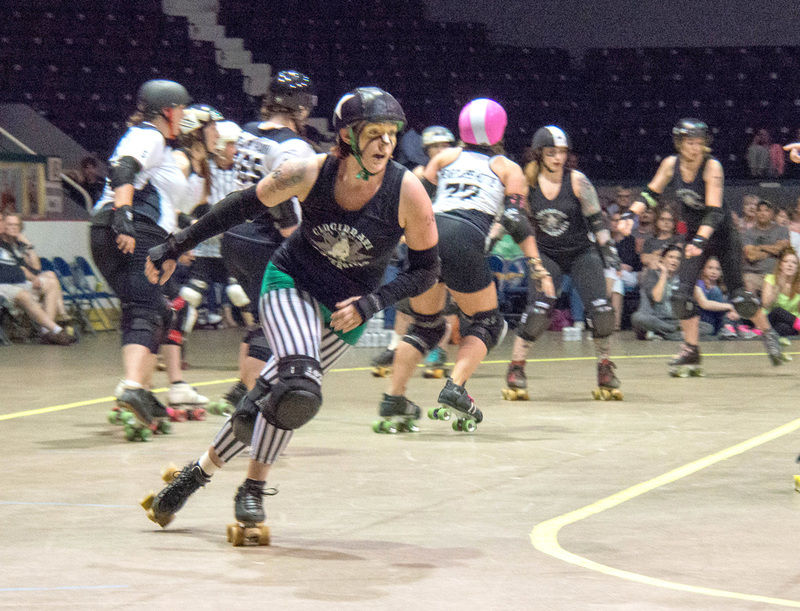 The refs skate around in the middle of the rink, call out penalties, and keep track of the points each jammer earns. 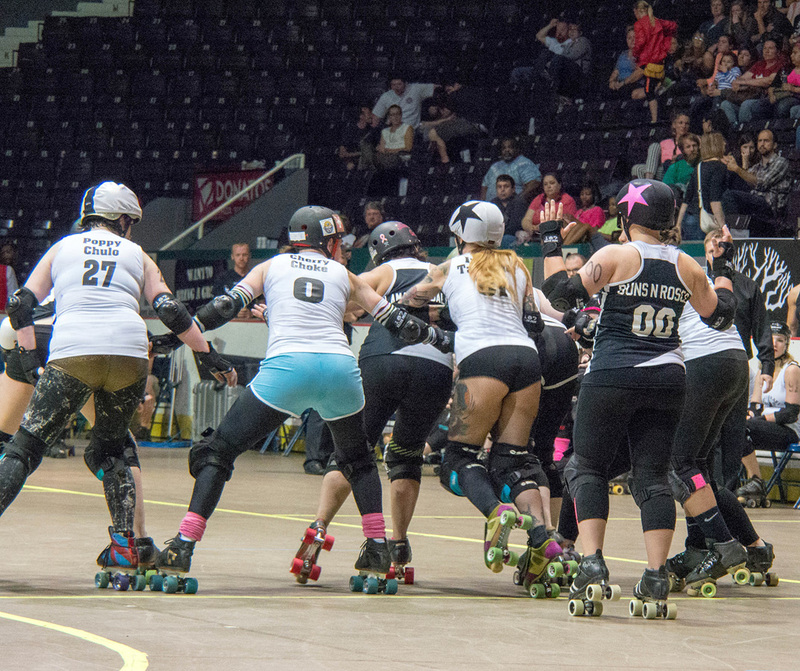 The jammer’s teammates not only try to block the opposing jammer from passing, but also set up blocking to help their own jammer get through. 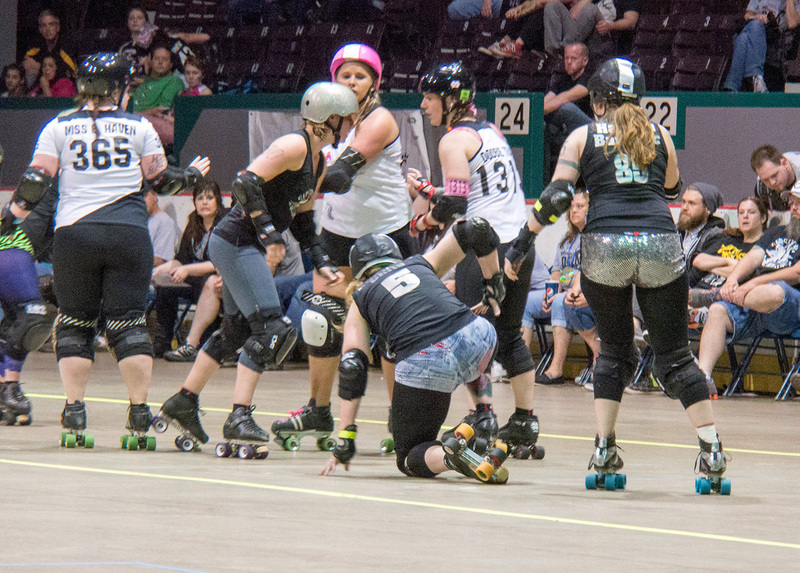 Because of all the blocking and pushing, the game gets a little rough at times. 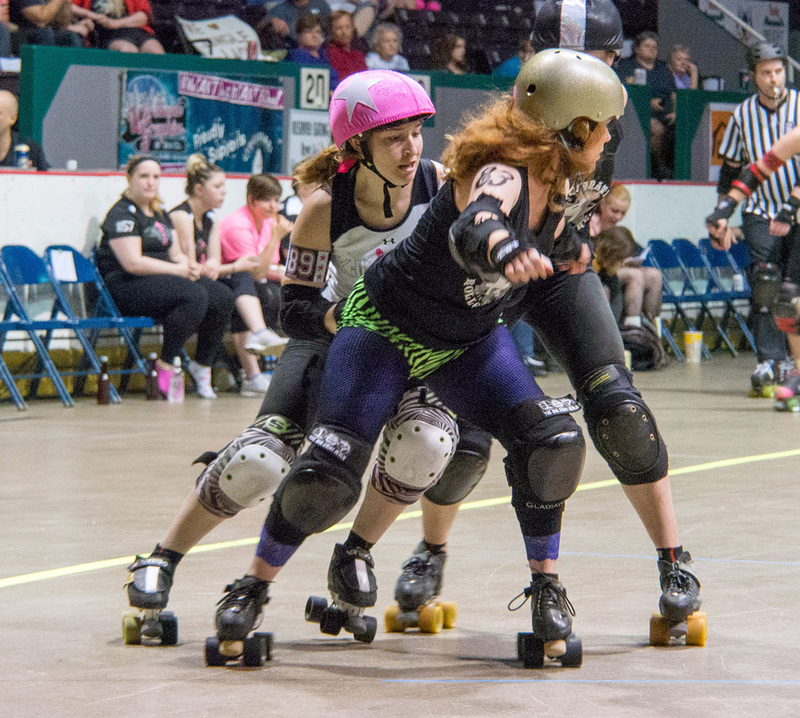 Blockers often try to push the jammer out of bounds. 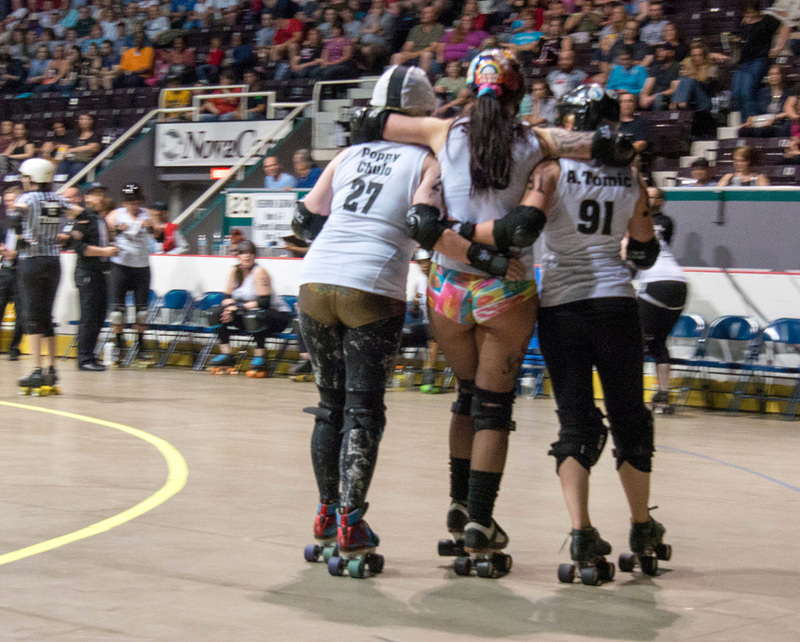 When that happens the jammer has to go to the back of the group and try again. 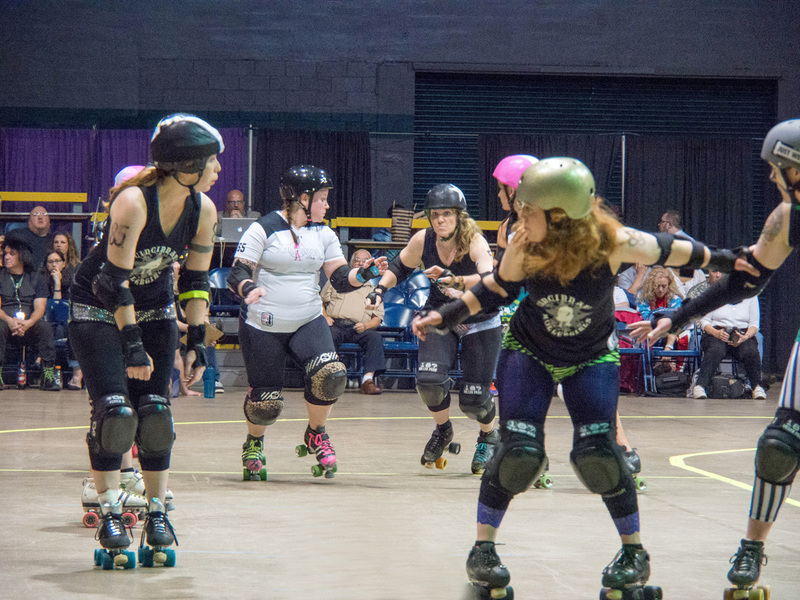 Unlike my previous, uneducated impression, roller derbies are not just rough free-for-alls. 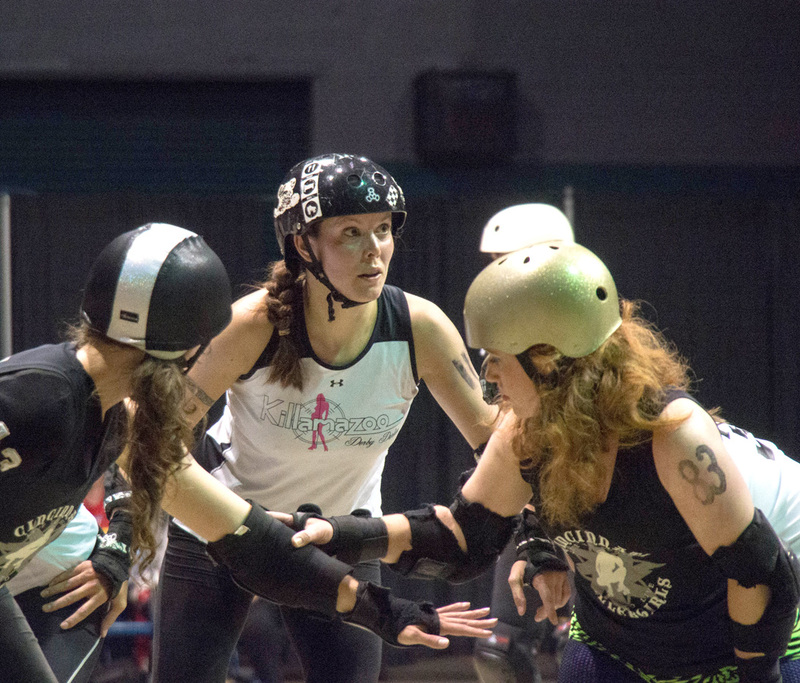 The young women care about the game and how their team is doing. 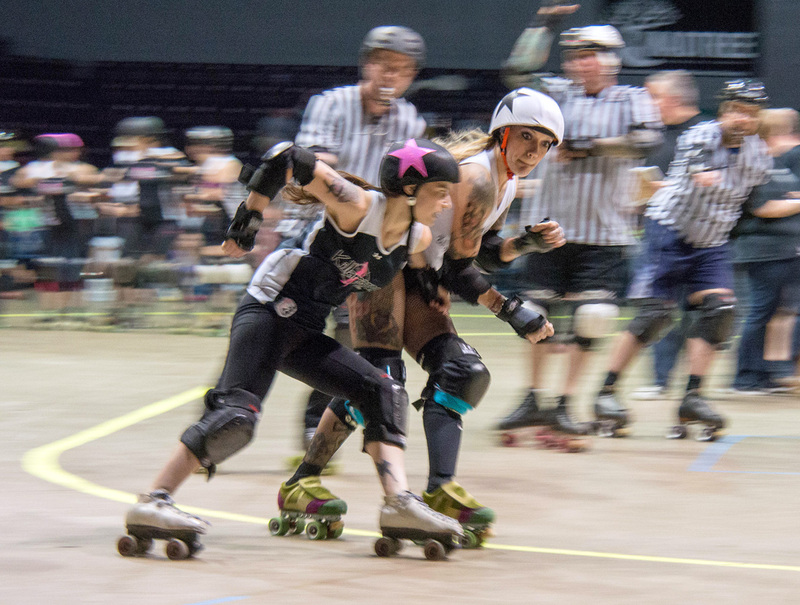 Here two jammers are going against each other. 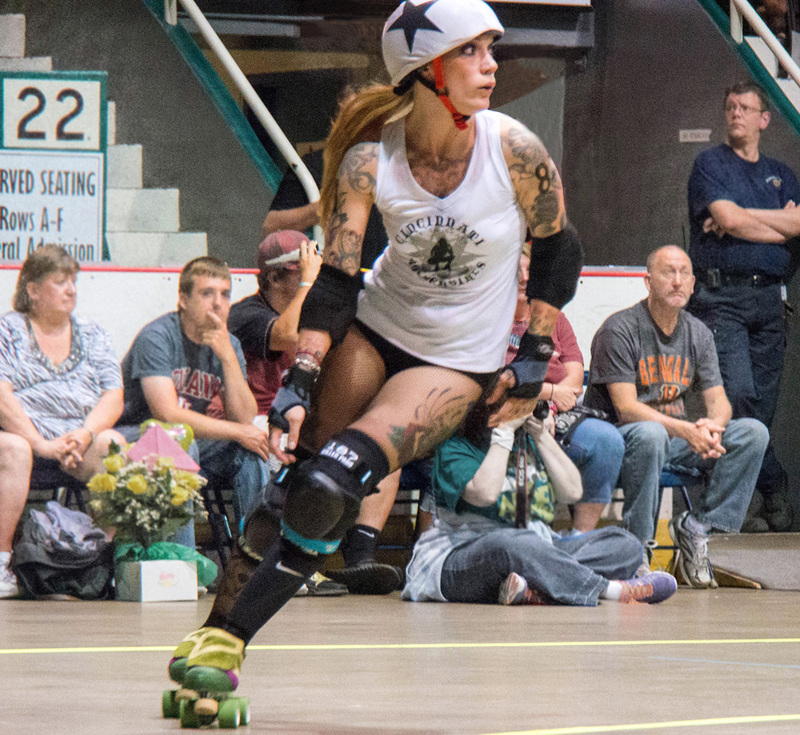 If the lead jammer falls behind, she can stop the jam so that her opponent does not score any more points. 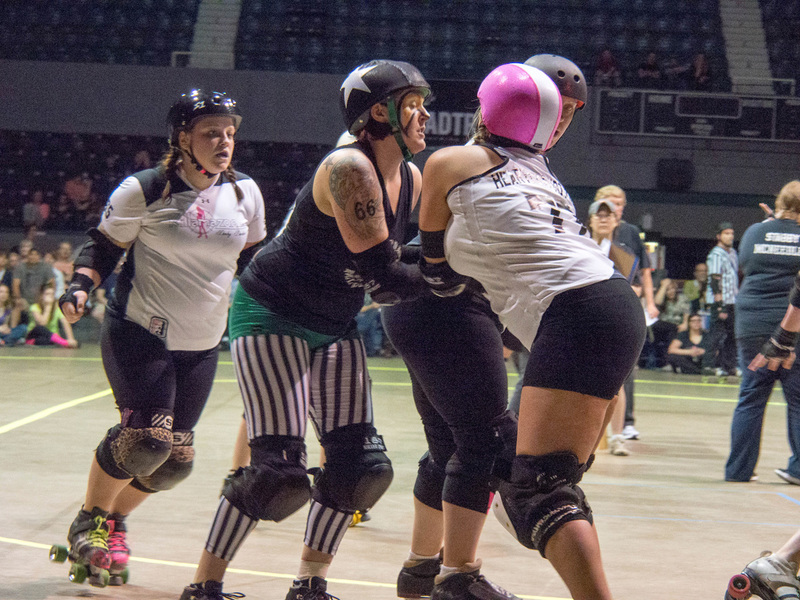 Here a blocker is trying to prevent the jammer from passing. 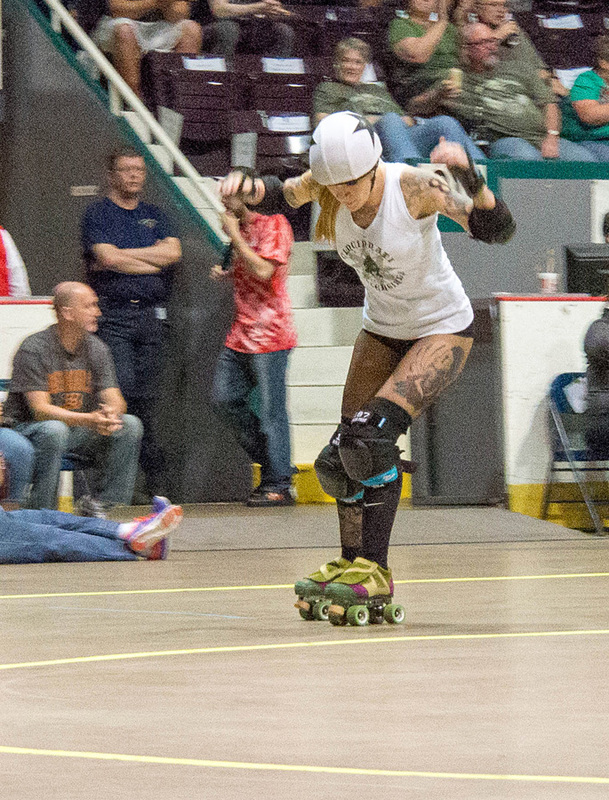 This jammer has decided to end the jam. Her signal to the refs is raising her bent arms up and down. 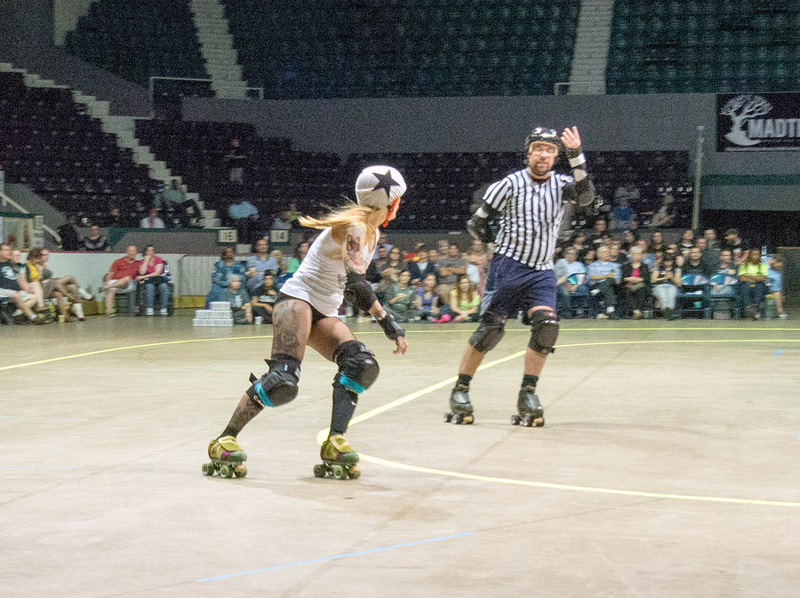 The ref blows the whistle; the skaters stop. And a new jam begins. 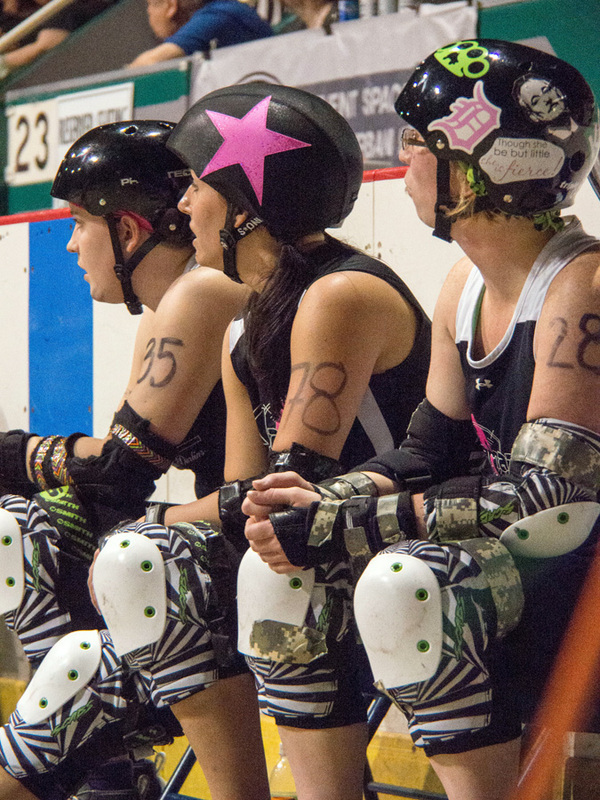 Usually, (perhaps always) a new team of skaters takes over each time the jam ends. 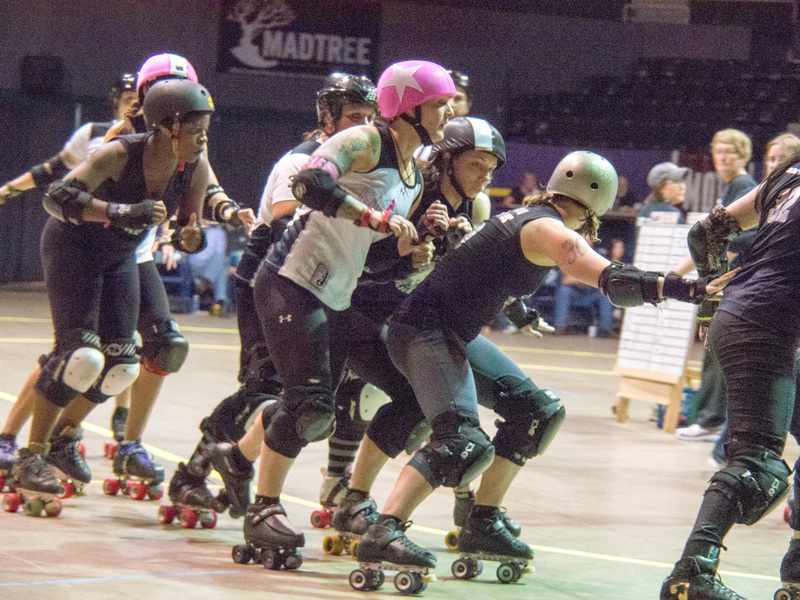 This jammer has broken through the blockers who turn to try to help their own jammer through. 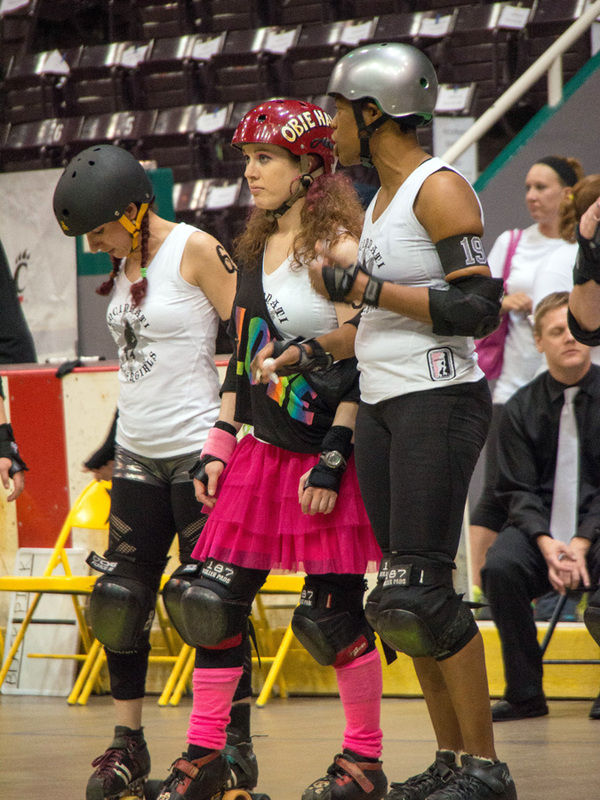 Often the jammers are the smallest skaters. 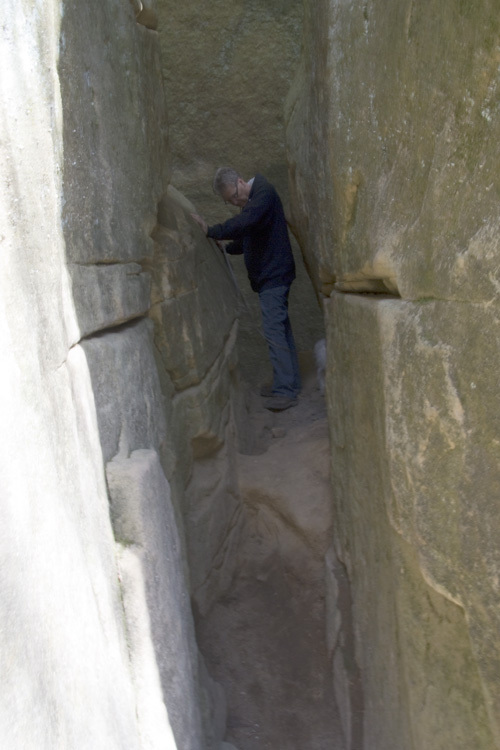 If they can’t push their way through, they can sometimes squeeze through small openings and at times jump over obstructions. 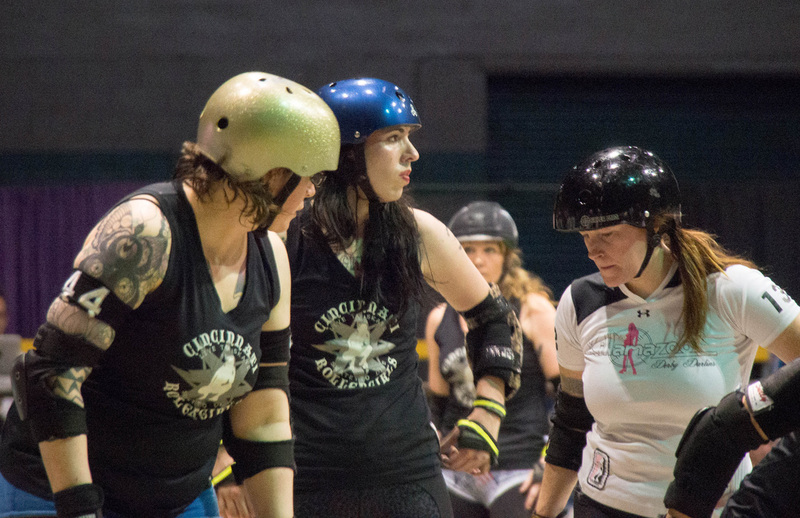 Maneuverability is important in a jammer. 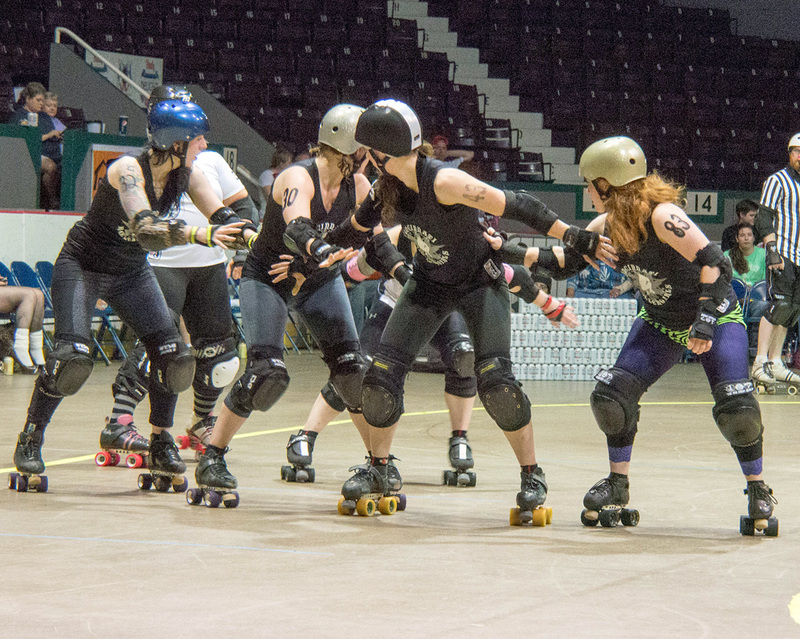 A group of blockers tries to hold the line. 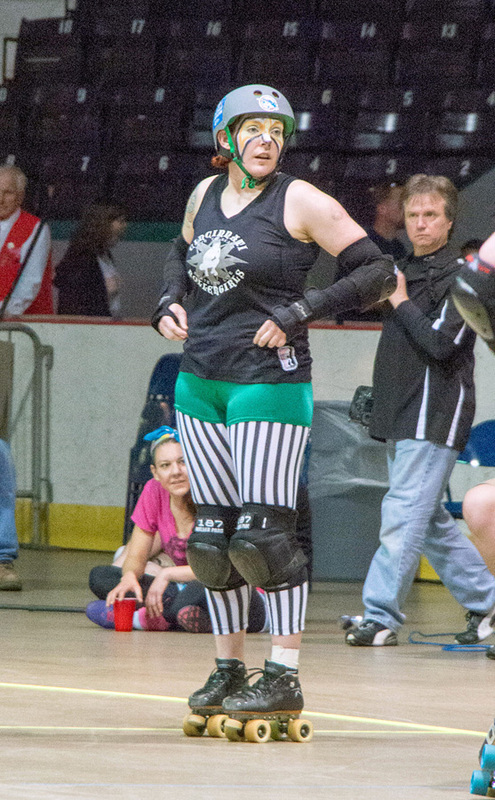 An individual blocker tries to obstruct the jammer. 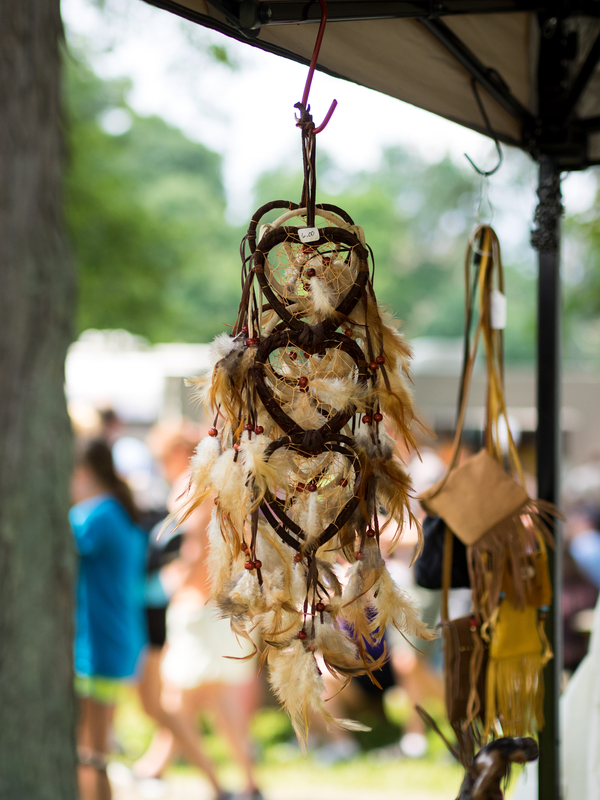 Hearts and souls are in the game. They give it all they’ve got. They plan their strategies, play their hardest, and strive to win. They are competitors. 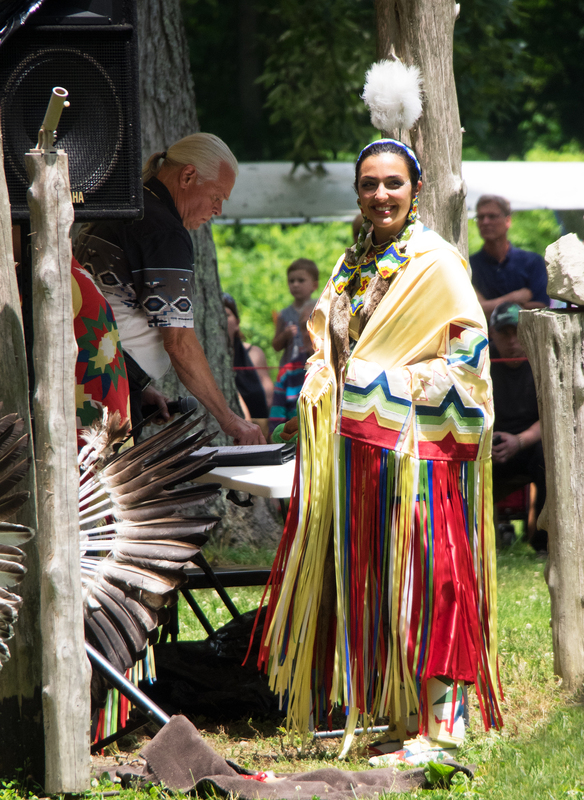 Our relationships with individuals are unique and take on their own, color, flavor, and song. 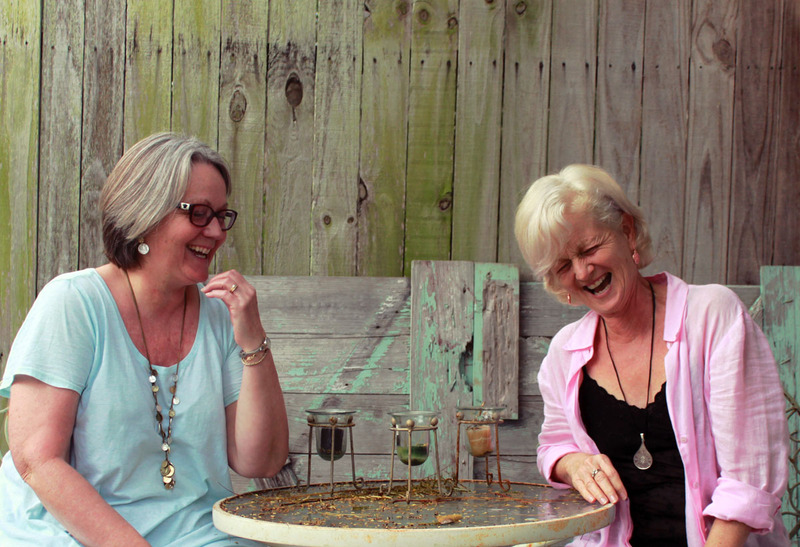 My sister Carol, who is little more than one year older than me, has the unequaled ability to transport me back to a simpler time and place when days were long, responsibilities few, and laughter contagious. at Krystal Beauty in Sarasota, Florida. 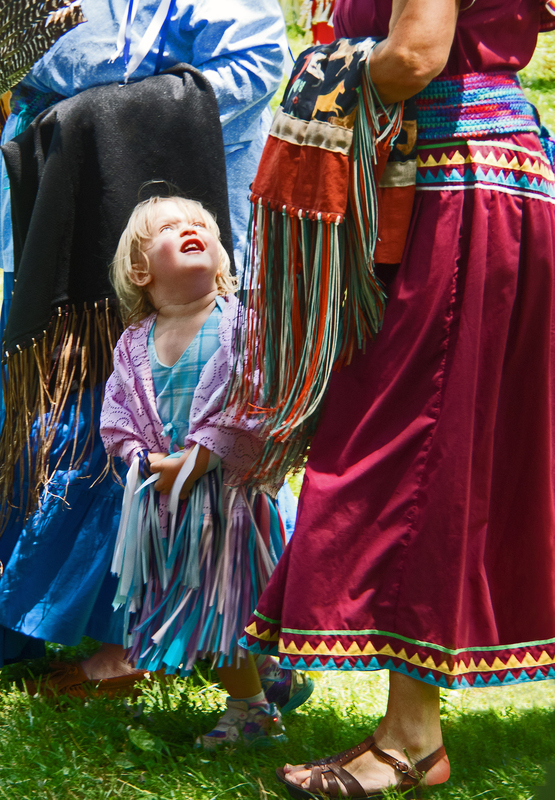 Is there someone in your life who makes you feel the joy of childhood again? 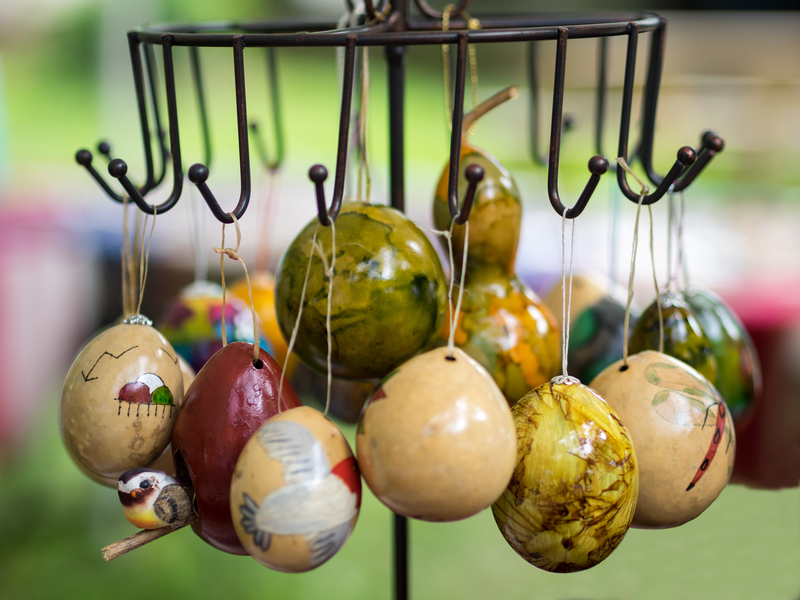 Just when I need another project, I started taking part in the 365Project. 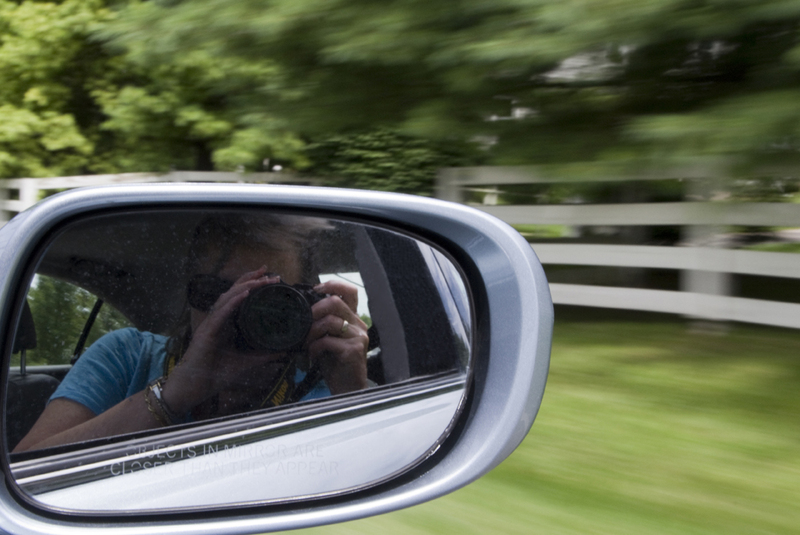 One of my photographer friends who I met last year at the Balloon Glow, and who invited me to join the West Chester Photo Club, told me about the 365project. 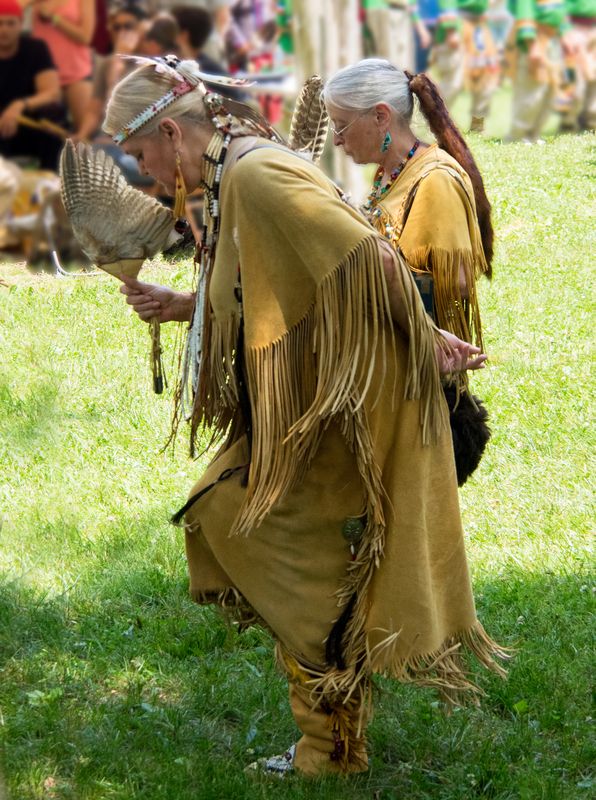 The idea is to take a photo a day and post it on your page there. 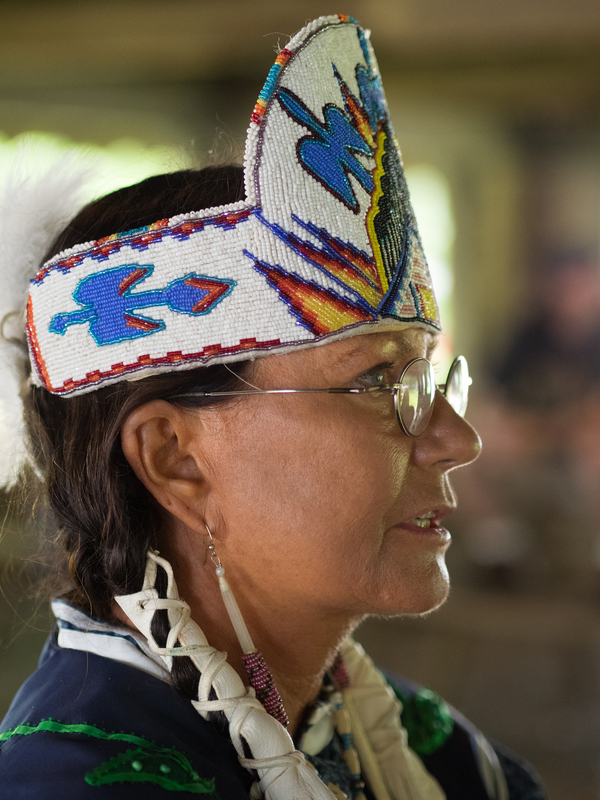 You don’t have to post every day, but the photo should be taken each day. Like many of the other social sites, you can make friends and comment on others’ photos. I think I will be able to learn a lot about photography this way. If you decide to join me there, make sure and let me know. You can tell me here or friend me there. I hope you will. 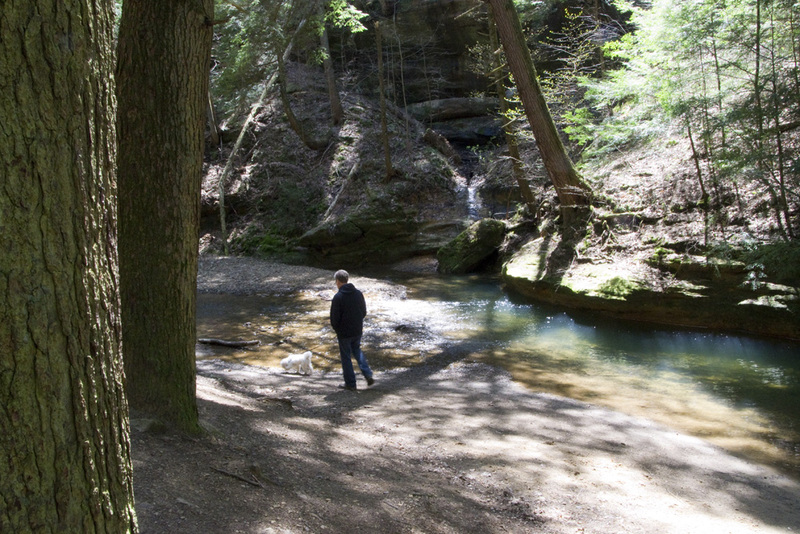 The trail to Cedar Falls in Hocking Hills State Park was another easy one to travel although there were more steps than the Ash Cave lower trail. And we were actually walking on a dirt path instead of a concrete one for most of the way. 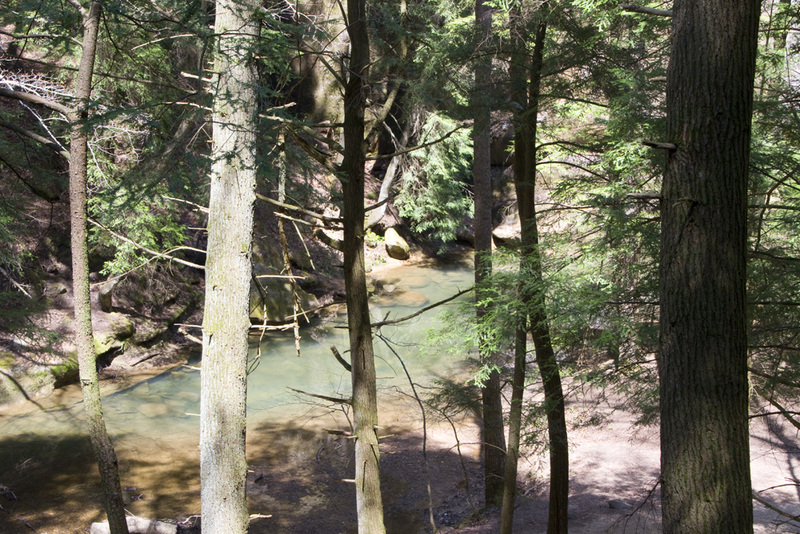 Interestingly enough, we were informed that there are actually no cedar trees in this park, although there are a lot of evergreens that I think were primarily hemlocks. 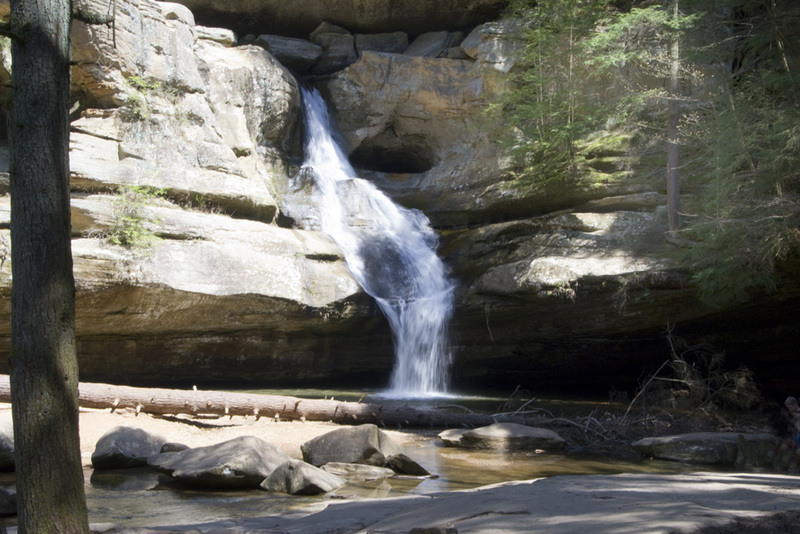 Not sure where the name for Cedar Falls came from. An amateur botanist or two, no doubt. 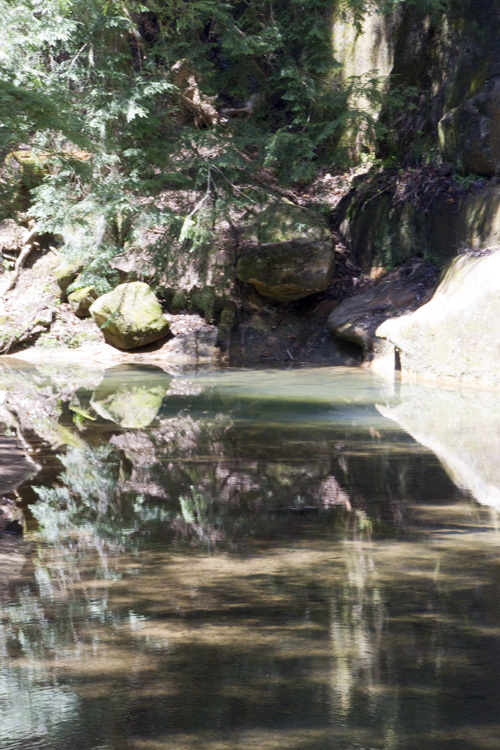 But there is a nice trail of water creating reflective still pools and gurgling along the trail to or, I suppose more technically correct, from Cedar Falls. 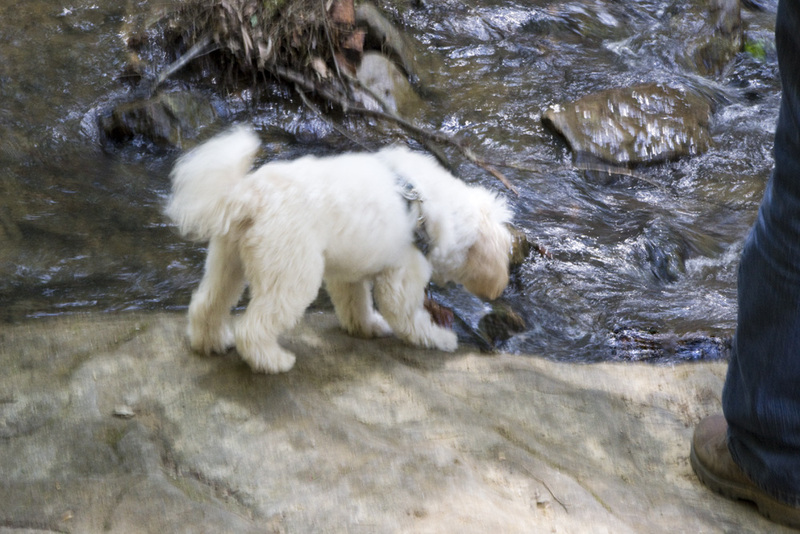 Arthur was trying to figure out how to get a cool drink from his perch above the stream. It’s a beautiful and serene place to walk. Because of all the spring rain the falls were fully cascading. Mark remembered there was only a trickle here during our last visit several years ago. 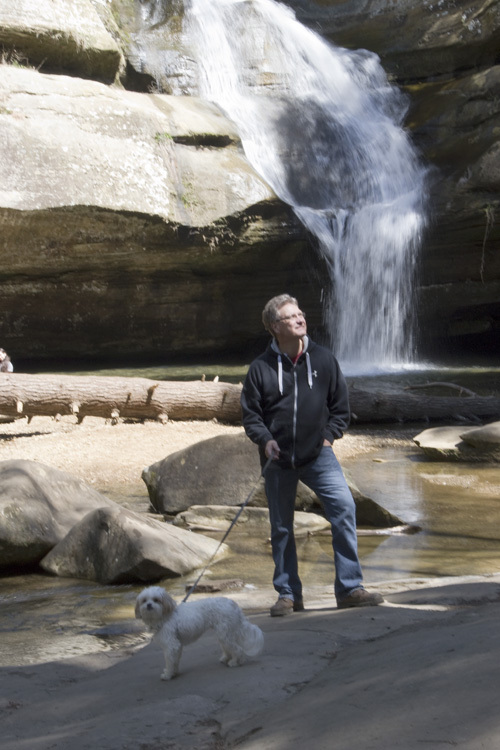 Cedar Falls is a popular attraction at Hocking Hills, and even on a Monday in April we found several people there. New friends for Arthur. 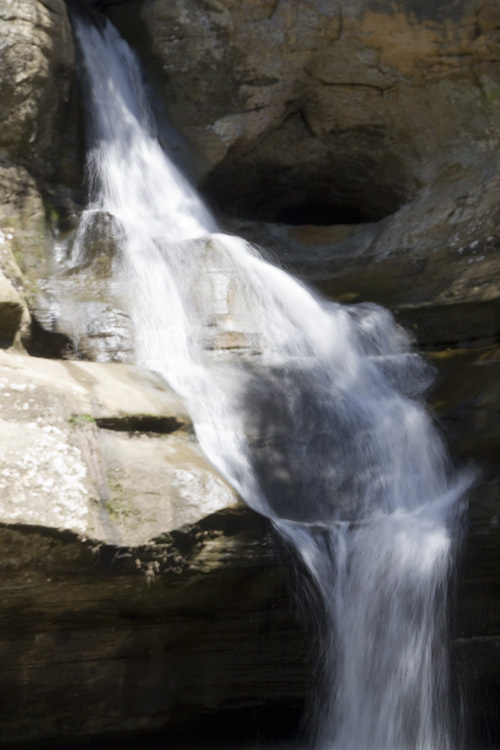 I tried to get pictures of the water flowing smoothly, which you do by setting a slow shutter speed, which also creates blurred photos if you don’t have a tripod. Mine was in the car where it did me absolutely no good. So I did the best I could. This is something I will work on later, with my tripod. On the way back the trail ended at a crevice in stone. 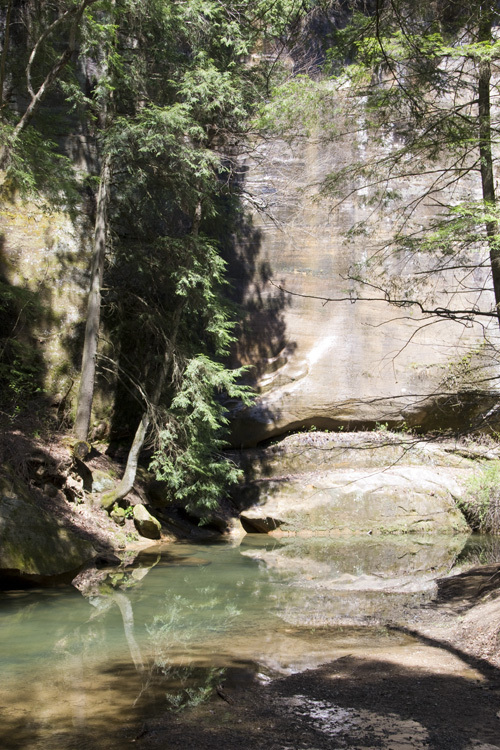 The children of a family of five who had already passed through were happy to tell us we could get through if we squeezed through the crevice, climbed down some boulders, and hopped across some stones in the creek. 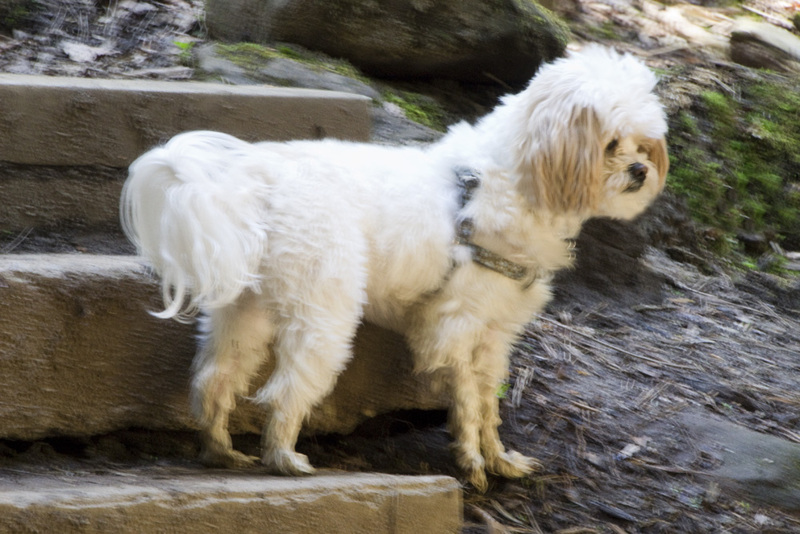 Arthur missed the part about skipping across the stones, as evidenced by the lower half of each leg. 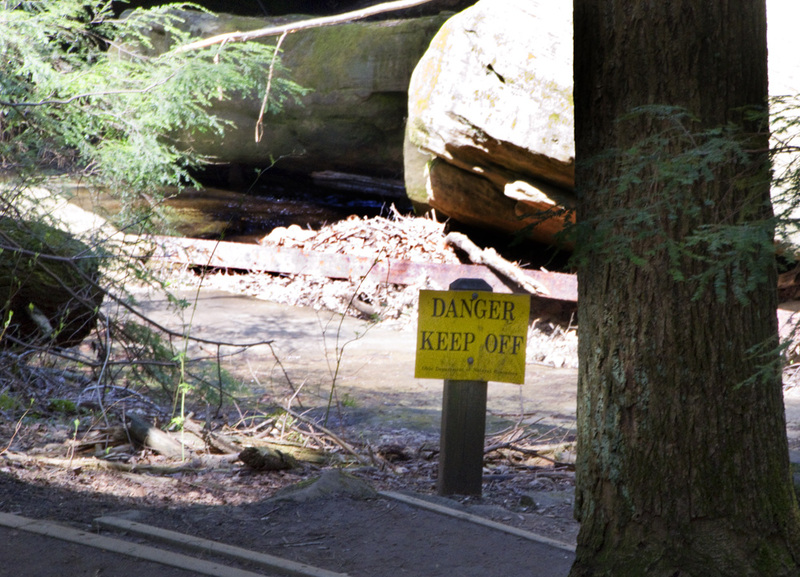 We saw this sign on the other side of the creek as we continued on our way. You can see the remnants of what might have been a bridge in the rubble in the background. Just two grown adults and a little white dog.